New Age Metals Inc. (TSXV:NAM; OTCQB:NMTLF; FSE:P7J.F) is pleased to provide an update on our Lithium division in Manitoba. – On October 22, 2018 NAM and the Sagkeeng Anicinabe Nation (Sagkeeng) signed an Exploration Agreement. The objective of the agreement is to promote a cooperative and mutually respectful relationship concerning certain mineral exploration projects being developed by NAM, and any additional mining claims or properties in which NAM may acquire an interest, located within Sagkeeng Traditional Territory. – The mineral claims are 100% owned by NAM’s Lithium Division, Lithium Canada Development, and an Option/Joint Venture has been signed on the claims with Azincourt Energy Corp. (AAZ). 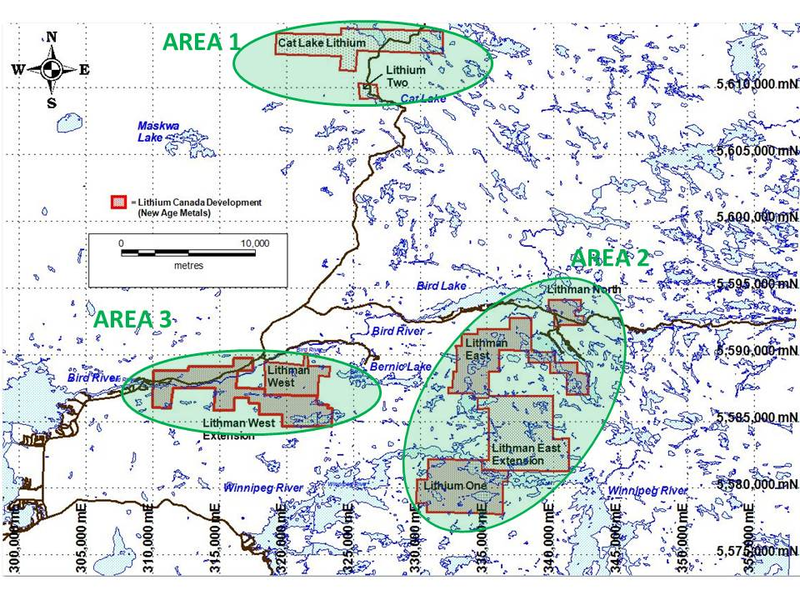 – The eight projects are strategically situated within the Winnipeg River Pegmatite Field, which hosts the world class Tanco Pegmatite that has been mined for Tantalum, Cesium and Spodumene (one of the primary Lithium bearing minerals) in varying capacities, since 1969. – Drill permits have been applied for on the Lithium Two and Lithium One Projects and the signing of this agreement with Sagkeeng has outlined a clear path to receive the approvals. The company’s Lithium Division, Lithium Canada Developments, has an aggressive exploration and development plan for 2018/2019. NAM’s Manitoba projects are financed via an Option/Joint Venture agreement with Azincourt Energy (AAZ) (see News Release Jan 18th, 2018). Figure 1: Claim map showing priority areas where archaeological studies will be completed as part of the new Exploration Agreement with the Sagkeeng Nation. If you have not done so already, we encourage you to sign up on our website (www.newagemetals.com) to receive our updated news. Click here to connect with New Age Metals Inc. (TSXV:NAM; OTCQB:NMTLF; FSE:P7J.F) for an Investor Presentation.